Commemorated around the world, Mother’s Day celebrates the lives of mothers who have sacrificed, loved, served, and impacted our lives. We see sales and specials in honor of women on this day; stores selling gifts to shower love on moms. But what about those women who aren’t mothers? The Gospel Coalition posted a stat that only 53% of women 15-44 years old are mothers. What about the other 47%? Many of those women have chosen not to be mothers. Many have not been able to have children — despite the strong longing in their heart to be a mother. This is a heavy burden on many women’s hearts on Mother’s Day weekend. And it often goes forgotten by those around them — including the church. Those Battling Infertility – Having gone through infertility and secondary infertility myself, Mother’s Day was one of the hardest days of the year for me and my husband. It’s hard enough having a monthly reminder that you aren’t a mother, but then having a sea of women stand up during a Sunday morning church service brings more tears to the forefront. And my husband could just see the pain in my eyes. As a pastor, attender or member of your church, don’t forget to acknowledge the women who are struggling alongside of the women that are being celebrated. Single Women – Many single women wrestle with not having a mate, but they also struggle with the longing desire to be a mother. Mother’s Day is a reminder of the unfulfilled future she desires or may never have. Lost a Mom – Many women are blessed with a strong, deep relationship with their mother, as are men. After a mom has passed away (regardless of the nature of the death), Mother’s Day becomes a yearly reminder of the mom that is no longer in her/his life and the void that remains. Lost a child – Within my journey of infertility, I gratefully never had to experience a miscarriage nor the loss of a child of any age. Mother’s Day is a reminder of that child who is no longer with us. Adopted Children – Most adopted children call their adoptive parents “Mom” and “Dad”; however, chances are that Mother’s Day is a reminder that their biological mother is not part of their life or that they haven’t met before. Woman who had an abortion – A woman who had an abortion once told me: “I will never forget the decision I made to abort my baby. It will forever remain etched in my heart.” Regardless of their ultimate view on abortion, a woman will always be reminded of the decision she made. 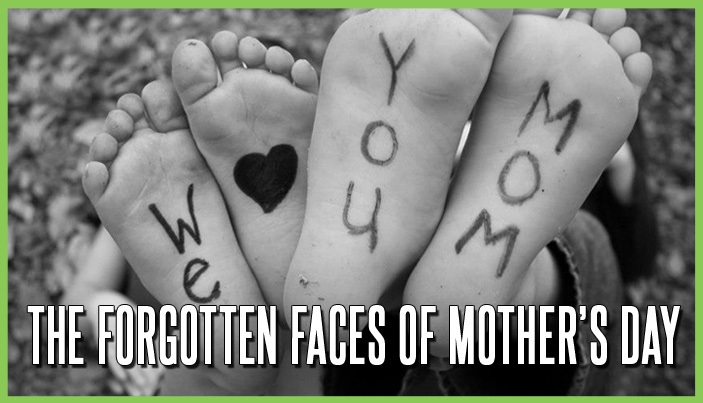 Mother’s Day is a reminder of the loss of her child and a missed opportunity to mother. There are so many other circumstances and situations that make Mother’s Day a difficult day to experience; however, most times these are silent struggles that women (and men alike) keep private and struggle to share with others. We shouldn’t feel like we can’t celebrate Mother’s Day. Our moms deserve being celebrated for all that they do. Yet at the same time, we need to remember those who are often overlooked and forgotten on Mother’s Day. Celebrate Mom. Remember those who are hurting….and remember the 47%.